Blue and white porcelain bowl and dish with 'Spiral and Lotus' decor. The inside of bothe pieces is painted in two concentric bands of alternating Lingzhi fungus and flowering Lotus sprays with a central spiral. The outside is decorated with a double ring and a similar pattern of alternating Lingzhi fungus and Lotus sprays. On the bottom of both pieces is a single ring and a sticker of the Tek Sing Treasures by Nagel Auctions. The Tek Sing Shipwreck (Chinese for True Star), also known as the 'Titanic of the East' was a 50 meters Chinese ocean-going junk. She set sail from China, bound for Batavia with close to 2000 people on board. The cargo consisted over 300.000 pieces of porcelain, other valuable cargo included green tea, silk, mother of pearl and herbs. The Captain attempted a shorter route through the treacherous Gaspar Straits. On 5 February 1822 the Tek Sing ran onto a reef and sank with a loss of almost 1800 lives. The next morning an English East Indiaman passed the location and rescued about 190 of the survivors. Another 18 were saved by a small Chinese junk. The treasure was salvaged by Captain Michael Hatcher in 1999 and was auctioned in Stuttgart in November 2000. 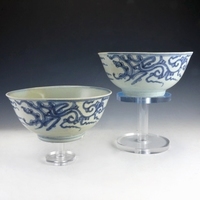 To this date the Tek Sing Cargo is the largest cargo of Chinese porcelain that has been salvaged from a shipwreck.